As one of the hottest cities to live in, there’s good reason everyone wants to be in San Francisco. But just because the Bay Area city’s cost of living is sky high, doesn’t mean you have to be a billionaire to pay it a visit. 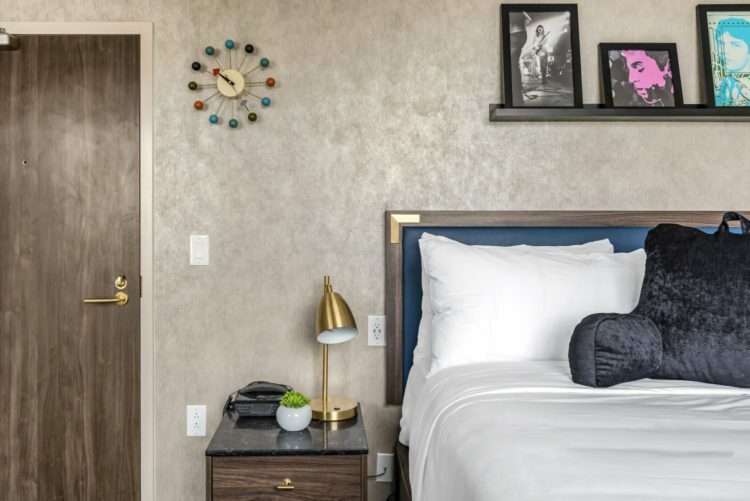 We had the chance to visit the newly opened Signature San Francisco, a boutique hotel in the SoMa district whose price tag won’t send you through the roof, but whose location is still in the middle of all the action. Because when you can save money on your stay, you can spend more exploring. And when in a city like San Fran, we’re trying to get out and experience a few Full House flashbacks, ride a couple streetcars and eat tons of seafood. So yeah, we could use some extra cash. Located in the up-and-coming SoMa district (that’s South of Market St.), Signature San Francisco was designed with the curious traveler in mind. The 34-room hotel is intended for those looking to explore the city by day and rest their head—in an ultra-trendy room—by night. 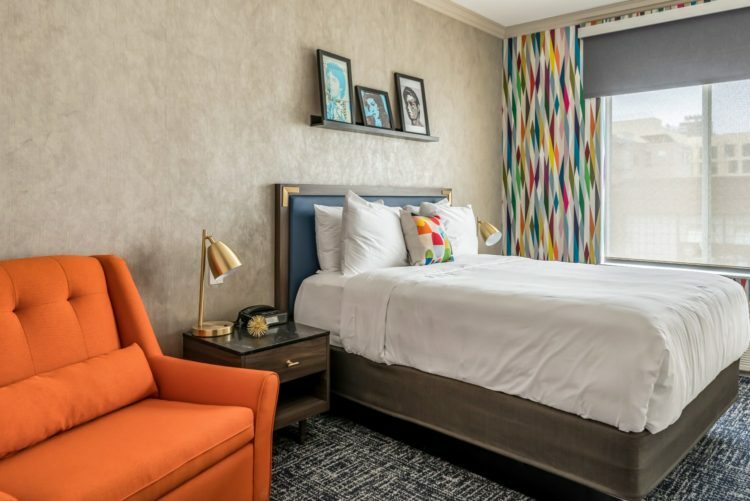 With yesteryear in full focus, the colorful hotel is the first of the Signature brand to open, and brings back the golden era of travel when a hotel was simply somewhere to sleep at night. There is no restaurant, spa, elevator or over-the-top lobby to distract you from the vibrant city. But what it does have is an affordable price tag that still gets you all the trendy design you could want. With mid-century style, rooms feature pops of bold color, retro touches and even funky bathrooms. Each of the 34 multidimensional showers were 3D-printed and designed by Mario Romano. While most feature patterns like waves or honeycombs, there’s one designed to look just like Marilyn Monroe—how’s that for a unique amenity? For a dose of history and a massive menu of seafood dishes (you are in San Fran afterall), visit Tadich Grill, California’s oldest restaurant, operating since 1849. If pizza and pasta is more your thing, Zero Zero is located within walking distance to Signature, while the casual Deli Board is found just around the corner. The small sandwich shop serves up massive creations while classic hits spin on a record player. 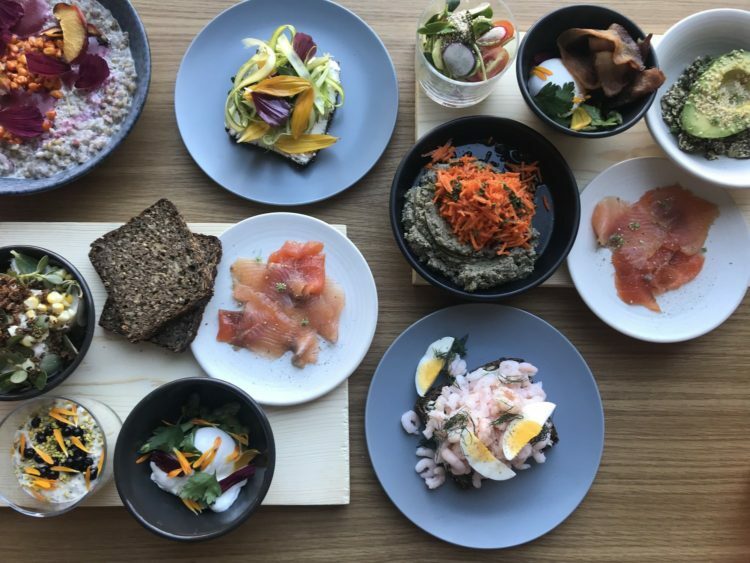 Hop on a street car and head to Kantine, a brand new Scandinavian shop for simple breakfast (get the danish!) or pop across the street to Sightglass for a local cup of coffee. For true food heaven, Yank Sing is a bustling dim sum restaurant and local fave with more than 100 varieties of the savory treat. Say yes to everything that comes your way; you can’t go wrong here. There’s more than plenty things to see and do in the city but one can’t-miss spot is Black Cat jazz club. Situated in the heart of the Tenderloin district, the classy outlet has a goth-glam vibe. Think crystal skulls, chandeliers, black brick walls and a cool “oh so you know about this place too” feel. Amid live jazz music, I learned a thing or two about the swanky music from their Passport menu, which features cocktails inspired by the different eras of jazz around the world. But it was the Mission Penicillin on their regular menu that won me over. A mix of tequila, lemon, coconut honey and mezcal, it was one of the best cocktails I’ve had. The lively Cuban music didn’t hurt either. More drinks await you across the bay in Alameda at St. George Spirits. The locally run distillery churns out artisanal gins, vodkas, liqueurs and more. Get your hands on the Terroir Gin that tastes like a dusty California road on a sunny Sunday afternoon—in a good way, or the sweet and spicy Green Chile Vodka, among many others. Visit for a tour and tasting of all their decadent spirits. When night falls, make your way to the Exploratorium after stopping at the famous Ferry Building to get a scoop of ice cream at Humphry Slocombe. The funky San Francisco-based outlet dishes out flavors like Secret Breakfast, a mix of bourbon and corn flakes; and Blue Bottle Vietnamese Coffee, a blend of coffee, chicory root and condensed milk. For a more subtle treat, opt for Harvey Milk & Honey Graham; you won’t be disappointed. Just a short walk away at Pier 15 you’ll find the Exploratorium, a science-based museum full of interactive experiences. Think the Arizona Science Museum on a much bigger scale. While you can visit during the day, stop by on a Thursday evening for the adults-only After Dark experience. Explore more than 650 trippy hands-on exhibits, spread across different categories that focus on different themes like touch, vision, psychology, sociology, light and more. The starting rate for Signature San Francisco is $199 per night.